This talk will show off the Java Modelling Language (JML), an industrial-strength contract language bolted onto the head of Java, and C0, a simplified version of JML developed for Carnegie Mellon University's introductory data structures course. I'll talk about how contracts can be used to teach introductory computer science students (AND YOU) how to write correct algorithms and better tests. We'll also take a quick look at how JML was used with a computer-assisted theorem prover to diagnose and fix a bug in java.utils.Collection.sort()! Rob Simmons is a native Atlanta, Georgian and hopeless cat lover. He finished his Ph.D. in computer science from Carnegie Mellon University in 2012. After that, he taught computer science at Carnegie Mellon University's Computer Science Department from 2012-2016. 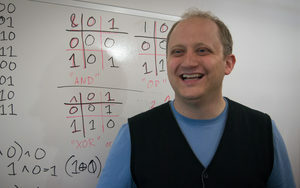 In mid-2016, he moved to Raleigh, North Carolina where his wife, Chris Martens, is a professor of computer science at North Carolina State University. He currently does freelance computer science education, tutoring, and curriculum development.